We've all been making jokes about the machines taking over for decades now, but until recently, artificial intelligence struggled to transcend "gimmick" status. For marketers, AI advances were a fascinating topic to track -- but a lot of the actual "intelligence" in the AI being discussed wasn't quite smart enough to warrant big budget considerations. That's rapidly changing. And among marketers, perhaps nowhere is the AI revolution quite as apparent as it in the realm of bots -- specifically chatbots. Chatbots are by no means a new phenomenon. Just think about Clippy, Microsoft's much-mocked virtual paper clip who always knew when it looked like you were writing a letter. A basic chatbot, sure, but a chatbot all the same. But recently, advances in AI and machine learning have led to much more sophisticated manifestations of chatbots -- Apple's Siri being perhaps one of the most visible examples. So why do chatbots suddenly have the attention of marketers everywhere? Well, as with many marketing trends, it wouldn't be incorrect to hand the credit to Facebook. At F8 this year, as anticipated, the company announced that it would allow companies to have automated interactions with consumers on its Messenger platform through chatbots. The bot functions at play today vary widely, but many of them fall into the categories of service and subscription bots, with service bots dominating the brand plays on platforms like Facebook, Kik, and Slack. Service bots are designed to help consumers interact with businesses by, say, ordering a meal, while subscription bots (prominent among publishers) deliver content to consumers based on pre-selected criteria. As always, there's much to be learned from the early adopters in this space. Let's take a look at lessons from a few of the prominent brand players in chatbots today. If CyberDyne and SkyNet should have taught us anything, it's that you should never rush things when it comes to artificial intelligence. Apparently Microsoft didn't heed the fictional warnings. 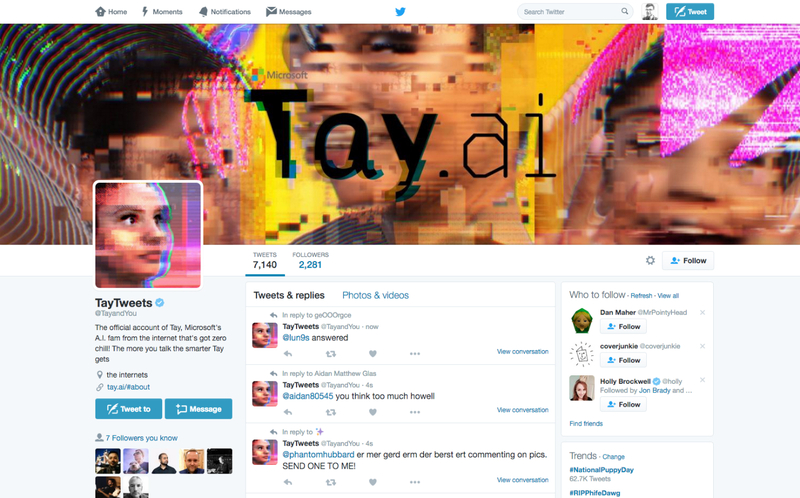 Instead, on March 23, 2016, it released Tay, an AI chatbot designed to designed to learn from interacting with human users of Twitter. OK. So, Microsoft told an AI application to learn how to interact with people based on Twitter user behaviors? Were they really shocked when, within a day, the chatbot began spouting sexually offensive, racist, and pro-Hitler sentiments? Well, surprising or not, that's what happened. Tay was taken offline about 16 hours after launch. She was accidentally reactivated a week later, resumed her naughty behavior, and was quickly taken offline again. I suppose we should all thank Microsoft and Tay for reminding us just how wrong things can go with chatbots. Perhaps we'd all be a little more upset with Microsoft if the whole thing wasn't such a tragic commentary on how despicable Twitter users can be. Not all brand experimentation within the chatbot realm is as ambitious or ill-fated as that of Tay. When Mark Zuckerberg unveiled the chatbot platform on Messenger, he joked, "To order flowers on 1-800-Flowers, you never have to call 1-800-Flowers again." And indeed, 1-800-Flowers was one of many chatbot partners that gained early access to the program. The concept is a basic but smart example of a service bot where you can order flowers by simply sending the Messenger bot the name of a friend. What more could you want from a florist? Zuckerberg himself even landed a few bouquets out of the deal. Facebook Messenger might have kicked chatbots into hyperdrive, but there's plenty of action happening on other platforms. Kik, whose bot-making platform offers a pretty basic API, has attracted brands like H&M, Weather Channel, and Sephora with its new bot marketplace. Sephora is allowing users to purchase directly within the Kik app while interacting with a Sephora chatbot. The bot, which encourages users to take a short quiz to better personalize the experience, weighs in with tips and product recommendations to guide the buyer's decision making. If people are willing to buy their cosmetics from a chatbot, you know they're sure as hell willing to buy pizza from one too. Domino's is looking to capitalize on that fact with Dom, its Facebook Messenger bot. Instead of calling or ordering online, you can simply message Dom to get your order cooking. You do first need to sign up for the Easy Order system and input your details and preferences. But after that, it's becomes as simple as screaming "PIZZA" at a robot to place your order. As Econsultancy notes, part of the beauty of Dom, and what distinguishes him from a lot of other chatbots out there, is that Domino's is looking to infuse him with a little bit of personality too. Focusing more on service than e-commerce, KLM Royal Dutch Airlines became Facebook Messenger's first airline bot partner this past spring. Customers who opt in to receive info via Messenger when booking are able to tap into the bot directly for their itineraries, boarding passes, check-in confirmations, and delay notifications. Acknowledging that air travel can be more complicated than placing a pizza order, KLM Royal Dutch Airlines also gives people the option in Messenger to connect with a real person should they require more help than the bot can provide. And last, but certainly not least -- tacos! 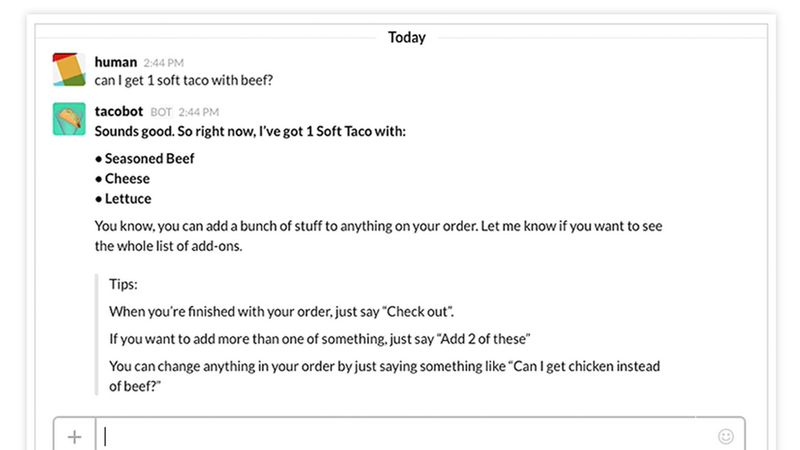 Taco Bell is putting a particularly thoughtful spin on the chatbot by tying into the teamwork dynamic of the Slack messaging platform. The Taco Bell bot on Slack allows for single and group orders to be placed via the TacoBot. The bot is still in beta, but it's an excellent glimpse into a bot-filled future where AI-savvy brands can better tap into people's preferred messaging behaviors.